Wrapping up another LIBR 559L, Scholarly Communication. Another great class, I'll miss them! Plus the usual - see right hand side of blog. In all of the discussion around the Google books settlement, I'm not hearing anything about the implications of this fundamental change in direction on the basic business of Google. Google's motto is "don't be evil". Ethically, this would be a good model for any of us; for a search engine, this is also the basis of, and reason for, the trust that most of us continue to have in Google. What will the impact of licensing books be on this trust? Based on my experience, it would be very difficult indeed for any company to maintain the kind of trust that Google has built, with a licensing approach. Aside from the trust barrier that the toll barrier per se raises, there will inevitably be times when access is inappropriately denied. For example, the imperfections of any authentication system mean that at times, toll access will be denied even to those who have paid the tolls. More importantly, by getting involved with Google Books, no doubt with the very best of intentions, Google has accidentally walked into a situation that creates many an unintended evil. There are many aspects of analysis, which I do not have time to write about in full, so perhaps an example will suffice for now. With the current settlement, Canadian books are covered as our copyright laws are similar to those of the U.S.; however, this settlement does not extend beyond the U.S., so these books will only be accessible to Americans, not Canadians. A U.S. citizen will have access to a book where even the family of the author, or the group that the Canadian author wrote about, has no access. If my own recently-published book, Scholarly Communication for Librarians, had been published just a few months earlier, it would be included in Google Books. This means that it would be readily available to U.S. citizens, but not to the people of my country whose taxes paid the lion's share of my public education, nor to the library school at the University of British Columbia that gave me the opportunity to teach scholarly communication, the course that was the basis for this book. One obvious remedy is to remove all foreign-published books from Google Books; indeed, with the current settlement, most foreign books have already been eliminated. This may help to advance Google Books from a purely legalistic standpoint - but what does this do to the likelihood of Americans developing a more inclusive, global view? The easily accessible and usable digital library is very likely to replace the print collections for a great many students; if foreign books are removed, this means that the chances that American students will be exposed to ideas from outside the U.S. will greatly diminish. This short term advantage for the U.S. will likely create much greater disadvantages in the medium term. Americans will be less able to compete in global markets, for example, and less prepared to diagnose, address, and prevent security problems - including developing the broad-based cross-cultural perspective that all of us need to live in harmony in our globalized world. Plan to get out of the Google Books business at the soonest possible opportunity. How? Put the books back where they belong. If they are from the public domain, put the electronic versions into the public domain, equally available to all - including competitors. "Scanned and made available by Google" on the book is appropriate. Print on demand would be a useful and not-evil service. If they are in copyright, give them back to the copyright owners - the publishers and author. By all means, negotiate compensation such as a share of profits to recoup the monies spent on digitization. But the sooner Google is out of the licensing business, the better for trust in Google. If the works are orphan works, leave this matter with the legislators; join with the Open Contact Alliance to find a solution that will work for everyone. As a PhD student, I see the benefits of this approach and would love to have access to this great electronic library. What an advance this would be, over our current situation where every copy of an important book owned by any library that could provide a copy in reasonable time, may be on loan, and the chances that the book is available through a bookstore slim to none. Not to mention the research advantages of being able to search the texts of books, even the books that we own in print. Thank you to Google, and to the libraries involved, for pushing the envelope and showing all of us what can be achieved. Scholarly Communication for Librarians: catalogued and in circulation! My book Scholarly Communication for Librarians is now catalogued at SFU Library - and, even better, on loan! This issue of The Dramatic Growth of Open Access features a few key quotable numbers to illustrate the growth and current extent of open access: more than 4,000 fully open access, peer reviewed journals in DOAJ, growing by 2 titles per day; close to 1,500 open access repositories listed in OpenDOAR, adding a new repository every business day; over 30 million free publications through Scientific Commons, growing by more than 20 thousands items per day; more than 20% of the world's medical literature is freely available 2 years after publication, and close to 10% is freely available immediately on publication; 1 more journal decides to submit all or most content to PMC every business day, and growth of open access journals in PMC is one new journal every other business day. The number of open access mandate policies is well over a hundred, and growing rapidly - but also likely understated. If you have a policy, please be sure to register with ROARMAP. This quarter saw some minor setbacks. Most notable (but still small) is a decrease in free content through Highwire Press. PLoS ONE may soon become the world's largest scholarly journal. As reported this quarter on IJPE, based on Peter Binfield's presentation at ELPUB 2009, PLoS ONE is already among the very largest of the world's academic journals, and, if current trends continue, will become THE world's largest journal sometime in 2010. PLoS ONE is one of the journals published by the high prestige, not-for-profit publisherPublic Library of Science. Thanks, PMC Staff! Also thanks for the neat "Free full text" tab, no doubt very handy for searchers, which also makes it much easier to collect data for the dramatic growth of open access. Strong year (added 693 journals), slow quarter (109 titles). 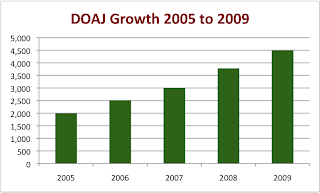 Note that additions to DOAJ are not the same as the total number of open access journals, but rather likely to reflect staffing / workflow issues. For example, this quarter covers summer months and the first OASPA conference, which Lund University, home of DOAJ, helped to host. Slow growth this quarterly is very likely to reflect such variables as vacation schedules and possibly staff secondments to help with the conference. IF YOU HAVE AN OPEN ACCESS POLICY, please register with ROARMAP. The ROARMAP numbers are likely understated, for example many people have pointed out that the number of thesis deposit policies is likely much higher than what is reported in ROARMAP. Registering helps with the numbers, but more importantly, a link to your policy can be most helpful for others still developing their own policies. PubMedCentral fully open access journals: despite strong annual growth, the number of fully OA journals participating in PMC dropped by 2 this quarter. Highwire Free: the number of free articles has dropped since last year by over 4,000. CARL Metadata Harvester: strong annual growth is offset by a loss of about 600 items this quarter (weeding project, perhaps?). A lot has transpired since 2016. In particular, my perspective has shifted from welcoming these new tools to serious concern about using these metrics as a new means of evaluating the quality / worth of scholarly work. Neither usage nor impact should be assumed to correlate with quality of the work. My most important (and probably least-read) work on this topic is my book chapter, The implications of usage statistics as an economic factor in scholarly communications. Sometimes we immediately recognize and celebrate important innovations (it is good to see Hawking and Einstein understood for the geniuses they are in their own time), but collectively we seem just as likely to ignore them (Mendel's pioneering work on genetics sat on the shelves for decades; according to Wikipedia, Galileo's pioneering work "was tried by the Inquisition, found "vehemently suspect of heresy", and forced to recant. He spent the rest of his life under house arrest". An article that falsely correlated vaccination with autism could be said to have had exceptional impact. Impact is a quality; like any other quality, it is neither good nor bad in and of itself. I submit that it is a reasonable hypothesis that new metrics involving usage via social media will tend to reflect and likely amplify existing social biases; e.g. works by men will more likely be tweeted than works by women, works by people with caucasian-sounding names will likely be tweeted more than works by people with names suggesting a different ethnicity and so forth. For this reason I think it is unethical to advocate for the use of alternative metrics as means of evaluation. Public Library of Science (PLoS) recently introduced article-level metrics. The PLoS article-level metrics are a substantial value-add for authors, including a range of download statistics, citations and social bookmarking data, and more. As an author, I would love to see this kind of service! It is interesting that a publisher with top-ranking journals on traditional metrics (impact factor) is also a publisher innovating in the area of metrics of far greater relevance, which say soon make impact factors irrelevant in the near future. One service that I, as an author, would like to see for the future, is a means of combining statistics from institutional and disciplinary repositories with the publisher's statistics. This is a development that could be pursed either by publishers or by repositories. With the Google Books lawsuit settlement likely to be decided within days, here is my take on this topic. Libraries in recent years have been undertaking mass digitization projects, following two different approaches: working with Google to digitize the whole library's collection, including copyrighted works, or working with the Open Content Alliance under OCA principles, which include respecting the rights of content owners, and widest possible access, such as full open access for works in the public domain. The Open Content Alliance is the right approach. Despite laudable motivations of participating libraries and Google (to expand access to the written word and preserve these books), the Google Books approach of taking works that belong to others (whether content owners or, in the case of public domain works, all of us), is just plain wrong. The impact of the proposed Google Book Settlement would mean basically a monopoly on digital books for one company, and a significant loss to the public domain. Those involved in the class action lawsuit do not represent all authors and publishers, only themselves. Here is hoping that the Court will reject the Google Book Settlement, and that the libraries involved will abandon this approach and join the Open Content Alliance instead. The Compact for Open Access Publishing Equity (COPE) calls on universities to make a commitment to providing equity to open access journals. This is a key step in the transition to open access. I highly recommend joining COPE to every library, and university. Even if significant (or even any) funding is not immediately available, this is an important philosophical commitment to make, one that makes it possible to raise the question of whether such support should receive equal priority at budget time. One of the reasons that this is a key step is simply the recognition of the role that universities play (through libraries) as support for scholarly communication. This has never been a standard commercial transaction, where one side produces goods and services that are then purchased by the other side. Rather, university faculty write, peer review, and often edit scholarly articles; much of the work is done on time and in office space provided by universities. This system is currently subsidized through library subscriptions. Shifting support so that open access journals receive equitable treatment is only fair. My hopes for COPE are growth: I encourage every library and university to join. Also, I would like to see COPE someday move beyond support for article processing fees to include wholesale support for open access journals, hosting and support services, and more. Congratulations and thanks to all of the initial signatories of COPE: Cornell, Harvard, Dartmouth, MIT, and the University of California at Berkeley. Taylor and Francis first half results 2009: academic information revenue up 25%, and, are shareholders more interested in OA than T & F? Informa, the owner of Taylor and Francis, has published their first half results for 2009 - see the Informa Investors Page. 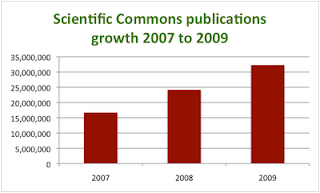 Highlights: academic publishing revenues and profits are up in the first half of 2009. Informa's Peter Rigby sees open access as not a bother for HSS, less relevant to a company like Informa than to a pure STM publisher. At least one shareholder is wondering whether Informa will push harder to move to an OA business model. Overall operating profit margin for informa was 23%, reflecting both strong performance in academic publishing and weak performance in events. Interesting question (see the end of the Q and A session) about "pushing harder into an open access business model". According to Informa's Peter Rigby, OA is less relevant to HSS and hence Informa as a mixed HSS/STM publisher; Informa is allowing post-peer-review self-archiving and has an open choice option, so is doing just fine. Another question related to whether Informa is doing anything about the cost in the area of academic information. No need, says Peter Rigby, as the sector is doing strong. This is an excellent illustration of the inelasticity of this market. 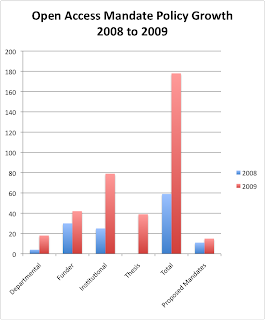 Taylor & Francis is growing in profits in spite of a worldwide financial crisis. No reason to look for efficiencies! For anyone who is wondering about my e-mail address change: from September 1, 2009 - August 31, 2010, I am on Study Leave from BC ELN, beginning a PhD program at the Simon Fraser University School of Communication , as well as some strategic planning and communication-related projects for BC ELN. To avoid confusion, I'm switching to just using my generic SFU e-mail ID, and recommend using this to get my attention. I do continue to monitor the BC ELN account. Course materials for my scholarly communication class (LIBR559L at the University of British Columbia's School of Library, Archival and Information Studies) can be found on the course blog, CC-BY-NC-SA licensed. Posted so far: the course syllabus (including the list of readings, all freely available online), the journal creation exercise, and the Scholar's Biography exercise. I would be interested in hearing from anyone who decides to make use of / rework these materials, although of course this is not required. The first time I taught this course the material formed the basis of my book, Scholarly Communication for Librarians, apparently published in June although I am still waiting for my copy! Two chapters of this book are open access: the Open Access chapter, and the Summary and Conclusions, featuring the main points of all the other chapters. While content recruitment at the local IR may seem slow and painful, from a global / historical perspective, the growth of open access in all its flavors is nothing short of phenomenal. The benefits of the IR for authors and for institutions will become more and more apparent in the near future. The chicken will emerge from the egg, and the IR will be seen as a great career choice. This session will provide an overview of the latest key trends in open access: why we need green as well as gold, both institutional and disciplinary repositories, and open access policies to fill the repositories. Institutional open access policies will be highlighted, introducing different types of policies, what makes for good policy, and approaches to open access policy development at the university. For details and registration for this and other programs , see the ALCTS Webinar Series. The production cost per journal in a small sample of 8 humanities and social sciences journals, as reported by Mary Waltham, ranges from $90 to $1,326 U.S. per page (online only, print costs subtracted). This is a price differential of close to 15-fold. That is, the most expensive journal costs 15 times more than the least expensive journal. The actual variation in price is likely to be higher, as this is a relatively homogenous group of U.S.-based journals that are the flagships of their associations, with costly rejection rates in the range of 90%. Production cots could be significantly higher than average humanities and social sciences journals with more common rejection rates. For details on the Waltham study, please see my previous post. Following are some thoughts on how humanities and social sciences publishers can move forward toward open access, inspired by Mary Waltham's brave preliminary foray into research on the economics of these journals, The Future of Scholarly Journals Publishing among Social Science and Humanities Associations, available for download from: http://www.nhalliance.org/news/humanities-social-science-scholarly-journal-publis.shtml. In brief: Humanities and social sciences publishers might wish to consider the marketing advantage of OA in positioning their associations / societies and journals for the future. Members of scholarly societies are scholars. Open access works to the advantage of these scholar-members, who likely have many reasons for belonging to a society, such as fulfilling the service component of expectations for an academic. Why not actively engage members in the transition? This could be helpful not only to transition journals to open access, but also healthy for the association, too. Institutional subscribers - libraries and consortia - are vocal advocates of open access. Why not engage them in discussion about how to transition? For example, would they consider hybrid site-license / open choice approaches? Since this is a priority for libraries, would moves like this help to protect society publishers from cancellations in these difficult economic times? This post re-analyzes Waltham's data on the feasibility of an article processing fee approach for the 8 journals studied. It is suggested that self-selection of journals may have resulted in high-end rather than average costs. Factoring in advertising revenue, it seems possible that the publication cost for online-only for even these high-end journals with rejection rates in the range of 90%, could be well under $1,000. Assuming that members and institutional subscribers continue to support the journals / associations, needed APFs could be reduced substantially, perhaps to 0. 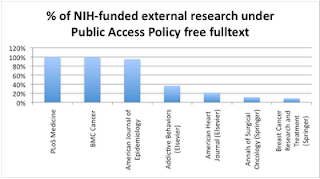 Which is indeed, what most OA journals charge: nothing! Waltham's 8 non-OA journals are contrasted with 716 journals listed in DOAJ under the same general subject areas. As Waltham points out, humanities and social sciences publishers are concerned about: "the publishing support costs of marketing and selling an online version globally to, for example, library consortia and many small society publishers become overwhelmed and decide to partner with a commercial or not-for-profit publisher who can manage and implement much of the complexity associated with the production and sales of the online version". For the humanities and social sciences journal positioning for the future, marketing to libraries and consortia can be this simple: register with the Directory of Open Access Journals. Libraries around the world are adding the DOAJ list to local serials lists and catalogues; DOAJ subject list links can be added to subject guides in a split second. With this simple step, the small society publisher can compete for impact directly with the large publishers. Would your members support a move to open access? Why not ask? The members of scholarly societies and associations are scholars. Open access works in their benefit; many will be authors of the journals supported by the association. Rather than fearing a loss of membership if journals are free, why not educate members about the benefits of OA and ask for their support in the transition? For the health of the association, it would be wise to carefully frame such research to encourage members to fully consider the full range of value and benefits of the association. People have many reasons for belonging to associations. Membership in a scholarly society per se is likely listed on many a CV. Active participation in association events and volunteer work for associations counts towards the service component of expectations for an academic career - and is a great way to network. It seems reasonable to assume that members generally approve of, and care about, the good work of their societies and associations, such as providing educational opportunities and scholarships. The question of whether members would leave associations in droves without exclusive access to a printed copy of an association journal should be considered within the context of these larger questions. Would your library and consortial subscribers support a move to open access? Why not ask? Librarians have been vocal advocates for open access and OA policy. Rather than fearing loss of subscriptions with a move to OA, why not sit down with librarians and figure out how to transition? The University of California and Springer are involved in an innovative site license / open choice for U Cal authors. Would your library customers support a similar move on your part? Perhaps a cooperative transition to OA would help to protect your journals from cancellations in this tough economic climate? First, I would like to emphasize that the vast majority of OA journals do not use an article processing fee approach. The following comments build on Waltham's data and analysis on the feasibility of an APF approach for the journals studied. Are Waltham's cost estimates on the high end rather than average? Waltham found a range of publishing cost / page from $90 - $1,326 (eliminating print costs, not relevant to OA), with an average of $360 / page. With an average of 19 pages / article, this would mean article processing fees would have to be on average $7,000 per article - or $1,710 for the journal with the average cost of $90 / article. Do Waltham's results reflect the high end of costs / page in humanities and social sciences? Note that this does necessarily reflect the skills of the researcher; it is tricky to do this kind of research, which relies for provision of data supplied by the publishers themselves, who obviously have a vested interest in research which could impact the revenue of their operations. This research study - which the author points out is very preliminary research - involves only 8 journals in the humanities and social sciences. Each of these journals was self-selected by its association publisher. Looking at the list of titles studied, it appears that each publisher selected its flagship journal. These journals were found to have rejection rates in the range of about 90%. These rejection rates are likely higher than those of the other journals produced by each of these publishers. Since a high rejection rate increases costs (rejected articles require processing, too), the costs of these journals may not be average for the publishers, but rather at the high end. It is common for OA publishers using the article processing fee business model to have differential fees, reflecting the cost of different journals. Most PLoS journals charge well over $2,000 U.S. per article, while PLoS One charges $1,300 per article, for example. What about the advertising revenue? Waltham's research found that up to 45% of a journal's revenue might be coming from advertising revenue. Once this is factored in, the APF for these probably high-end journals to cover remaining costs decreases to a low of $940 for the low-cost journal, or an average of $3,850 per article. What if memberships and institutional subscriptions continue? this changes the scenario for monies needed from APFs to nothing (which is what most OA journals actually charge) to perhaps a small fraction of the publication cost. While Waltham studied 8 humanities and social sciences non-open-access journals, there are 716 journals listed in the Directory of Open Access Journals in the fields of the 8 journals studied (details below). What is the difference between journals with a relatively low production cost / page (e.g. $90 / page) and those with a relatively high production cost / page (e.g. $1,326 / page). Hypothesis: one factor may be co-producing with a commercial publisher. Small independent association publishers may have less costs. "Analysis of the journal costs provided for this study confirm that a shift to an entirely new funding model in the pure form of Open Access (author/producer pays) in which the costs of publishing research articles in journals are paid for by authors or by a funding agency, and readers have access to these publications for free, is not feasible for this group of journals". This post is part of the Transitioning to Open Access Series. Comments are welcome. Please send me an e-mail, or post to the Open Access Tracking Project, ssp-list, or liblicense.